Brutus – Under the influence! 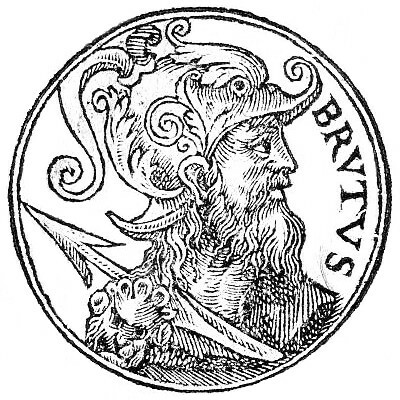 According to medieval legend the founder and first king of Britain was the Trojan exile known as Brutus of Troy, who was said to be the descendant of the Trojan hero, Aeneas. This claim was first documented in a ninth century text the Historia Britonum attributed to Nennius, followed by an account given by Geoffrey of Monmouth in his Histori Regum Britanniae, in the 12th century. Brutus does not appear in classical works and is not regarded as being a historical figure by most historians.